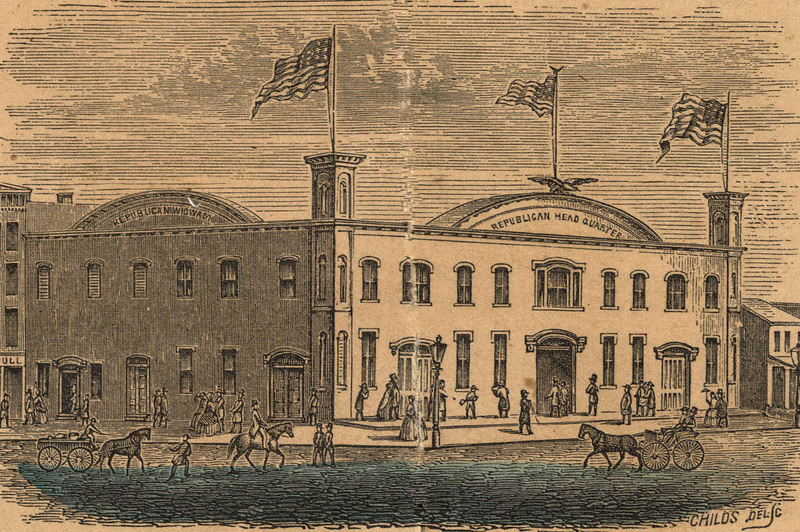 Republican "Wigwam" constructed for national convention of 1860 in Chicago, IL, where favorite son Abraham Lincoln was nominated for President on May 18. A few weeks later Sheffield Peabody attended a congregational meeting here--a sign of deepening ties between reform-minded evangelicals and the Republican party. Later, Sheffield "called on Abe Lincoln in the State House” (18 June 1860). One of the phrases that occurs most often in Sheffield Peabody’s early diaries is that he “went to meeting.” Sometimes this was for a secular function, like a town meeting or political gathering, but most often it involved his religious community. Sheffield and his family belonged to The Christian Church (often called the Disciples of Christ), a congregational movement that emerged during early 19th century and spread rapidly throughout the Midwest. Its emphasis upon the commonality of Christians, and not divisive creeds or “speculative” theology, had the effect of creating an egalitarian community. Numerous “Elders” are recorded to be preaching at his church: Boothe, Newell, Lot, Haynes, Havens, and many others—even on rare occasions a woman elder (15, 26 Jan. 1851). To borrow an agricultural metaphor, religious meetings of the Second Great Awakening did not remain fallow. By the 1840s and ‘50s they were playing an important role in anti-slavery politics, and although Sheffield doesn’t seem to have been an ardent abolitionist his religious life sometimes made contact with this more radical community. Having begun as a supporter of Millard Fillmore and the Whig Party (25 Oct. 1856), he attended a Republican caucus (1 April 1857) and eventually biracial religious meetings: “I went to three meetings in Chicago today, to one Presbyterian’s, to Congregationalist’s in the Republican wigwam, colored people meeting” (10 June 1860). Abraham Lincoln recently had secured the Republican nomination with evangelical support, and Sheffield encountered history at close range: “We took the cars from Alton to Springfield. Got there about 11 o'clock, A.M. There is some good country along the route. We called on Abe Lincoln in the State House” (18 June 1860). It proved to be a formative moment in his life.